Celebrity Gossip and Entertainment News: Did Lea Michele Hook Up with Naya Rivera's Fiancée'? 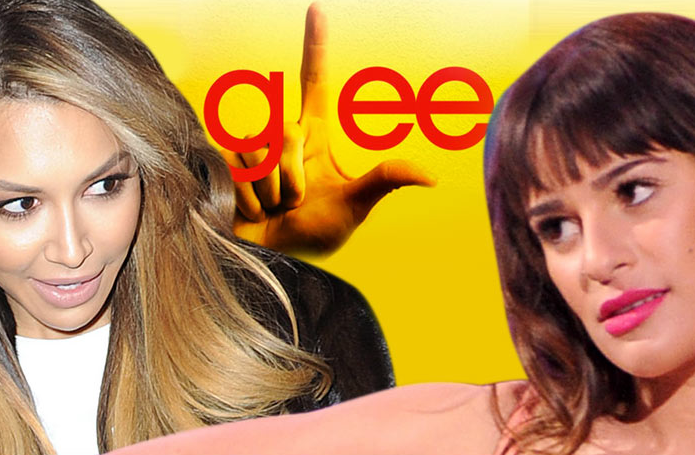 Did Lea Michele Hook Up with Naya Rivera's Fiancée'? Newly revealed blind item claims the real reason Naya Rivera stormed off the set of Glee is because her series co-star Lea Michele hooked-up with her fiancée' Big Sean behind her back. It is hurtful when your fiancé cheats on you. It is even more hurtful when it’s with someone you know. This pretty television Actress found hookup text messages between her Fiance… and one of her television colleagues! She screamed at The Fiancé about why – of all the people in the world – why would he f*ck around with one of her colleagues? The Fiance couldn’t even deny it. The evidence was right there on his phone. Our Actress went absolutely ballistic! She yelled. She swore. She threw his phone at him. She broke a few things. Believing that the sexual encounters may have taken place in her bed, she tore the sheets and blankets and pillows off the bed and threw them out. As you now know, they could not get past the indiscretion, and they broke up. So, who was Hookup Girl? Which of Our Actress’ television colleagues was hooking up with The Fiance? The female half of Bullygate. Allow that to sink in for a moment. Remember when we told you that Our Actress was unhappy that she was being given the bum’s rush off her television show because the Producers said that they didn’t want too many main characters leaving at once? It seemed like a pretty weak reason at the time, didn’t it? Well, it turns out that it wasn’t the entire reason. After her affair with The Fiance, Hookup Actress encouraged Producers to push Our Actress off the show as quickly as possible! That’s why Our Actress was going to be given the boot first! Well, now The Producers aren’t pushing anyone out… and Our Actress is contemplating staying! It’s her choice. Hookup Girl is in agony while she makes it. Things are very, very tense on the set right now. The writers are bracing themselves for more plot changes that will be required if Our Actress stays. What a mess! Well, the battle is over. Naya Rivera is leaving Glee. Here’s what happened: Naya Rivera found a series of very personal text messages on Big Sean’s phone from Lea Michele. Naya and Big Sean had a huge fight and the two broke up. The details of that fight are in the original blind. As you can imagine, when Naya had to go back to work with Lea, the atmosphere was incredibly tense. And less than 24 hours after we published this blind item… the two of them had a blowout on the set of Glee! After that encounter, both sides came out swinging, each accusing the other of being unprofessional/ jealous/ whatever. But you know what was really behind the tension! The whole cast and crew was in an uproar! The producers and writers were already scrambling to separate the story lines of two other feuding cast mates, the entire cast and crew was sick of the fighting and the tension, and it was just too much. Both actresses were called in separately to talk to producers. The situation was untenable, and one of them had to go. Naya – who we had told you was already vacillating back and forth about whether or not she was staying on the show – simply could not compete with Lea Michele for Ryan Murphy’s favor. Naya was released from her contract and will not be back for next season. The rest of the cast and crew are definitely not happy that Lea Michele triumphed in this battle. However, they are relieved that the fighting is over and just want to finish out the series in peace. Still want to be in show biz? You get to work with witches and warlocks all day.